Vanig is the world’s first integrated E-Commerce platform and Supply Chain ecosystem powered by the blockchain. Vanig Patent Pending solution addresses several significant Supply Chain and E-Commerce challenges and inefficiencies, providing a higher level of brand experience. Our Supply Chain ecosystem leverages the latest in blockchain technology through HyperLedger’s Sawtooth Lake technology. We simplify the E-Commerce experience and its embedded Supply Chain, eliminating intermediaries and manual processes as it ushers in a new level of transparency. The Vanig platform is safe, secure, and user-friendly, benefiting all members of the ecosystem and embraces cryptocurrency payments. It shortens recall process and timelines for manufacturers and retailers, providing real-time product visibility through to the consumer. Provenance information on products, increasingly an essential consumer ask, is fully integrated. Vanig is an integrated E-commerce platform and Supply Chain ecosystem that is powered by the blockchain. We aim to solve some of the major inefficiencies and challenges with the existing Supply Chain and E-commerce platforms. What are the problems and challenges that Vanig addresses? Vanig is aiming to solve the following major problems in the Supply Chain and E-commerce space. What is the Vanig E-commerce Platform? 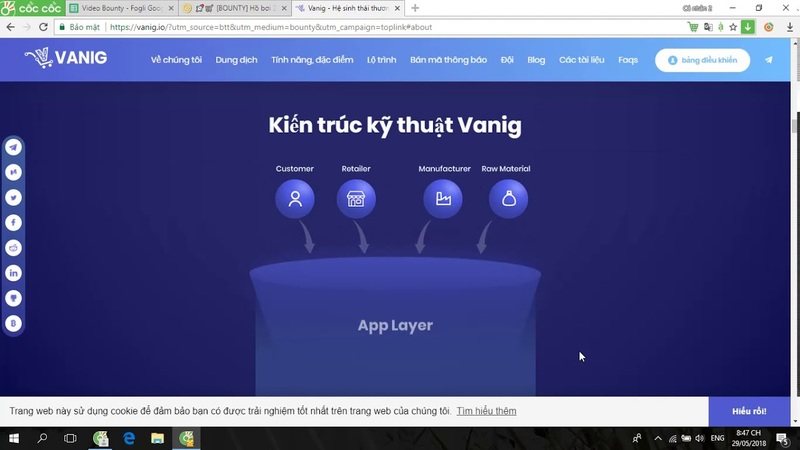 Vanig is building an E-commerce platform from the ground up. The Vanig E-commerce platform will be beneficial to all participants. The sellers will enjoy benefit of lesser selling fees (compared to other major E-commerce players) and instant payments, and the buyers will enjoy the benefits of buying trusted products, paying with different payment methods (including VANIG tokens) and be rewarded for purchases on the platform. Where can I find information on Vanig’s roadmap? Vanig’s journey started in early 2017, we have since then come a long way from assembling best in class team and advisors to building the solution framework and MVP. We are launching the Token sale in July 2018, our e-commerce platform's alpha version in December 2018 and launch the platform for South East Asia in March 2019. We are excited to be on this exciting journey to build Vanig as we envision it. Please check our whitepaper for a detailed roadmap. Do you have a working demo or MVP? Vanig’s E-commerce platform will be modern and sleek, it will have easy navigation for the buyers and sellers, Vanig will have AI/ML powered platform that will track buyers, sellers and products and will play a key part in making the platform trustworthy for everyone involved. We welcome you to try it out and let us know if you have any feedback.